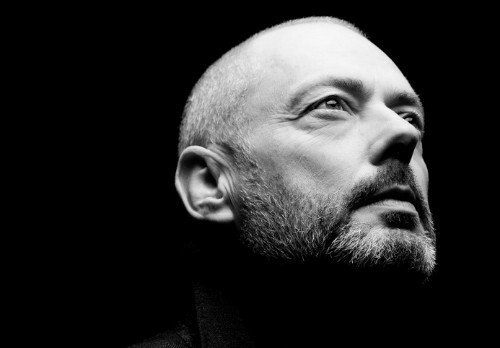 Padmore, Musical America's vocalist of the year. He is spiritual and spirted. A man for all seasons. 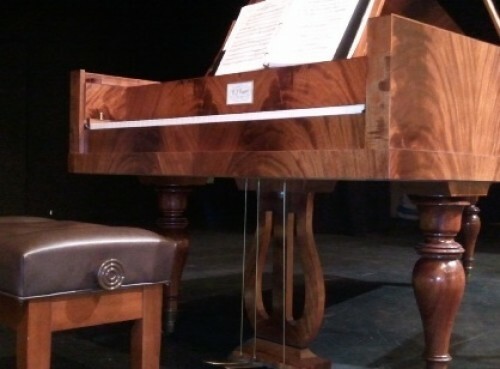 Rodney Regier who made the fortepiano on which Kristian Bezuidenhout performed, writes: The design is based on fortepianos from around 1830 by Conrad Graf and Ignaz Bosendorfer, both esteemed makers in Vienna. What you see on the case is American black walnut, from a tree that was cut in southern Pennsylvania. Regier who made this fortepiano writes: The veneer is wonderful - I couldn't be happier with its swirling, complicated presence. That sort of material reaches me after lots of calls, visits, and deciding "no." It comes from suppliers who are in a way shepherds, suppliers who sell veneer by the acre, but who recognize when they have something extraordinary and wait - almost interview - buyers until the right mix of use, pattern, size, and $ appears. "If a tree falls in a forest and no one is around to hear it, does it make a sound," Bishop Berkeley famously asked in a 1710 treatise. Italian instrument maker Bartolomeo Cristofori created the first fortepiano around 1700. 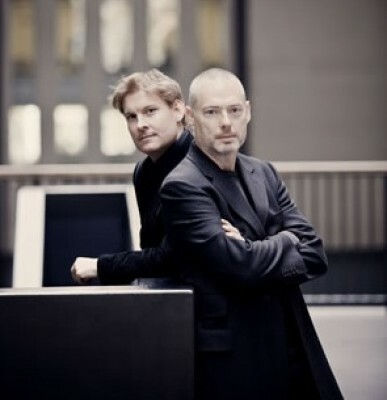 Schubert, whose Winterreise song cycle was performed by tenor Mark Padmore and Kristian Bezuidenhout as part of the White Light Festival at Lincoln Center, played the fortepiano. Padmore and Bezuidenhout performing at Alice Tully Hall bring a world to life with their emotional intensity. A fortepiano belonging to Juilliard was borrowed for the evening. It was made by R. J. Regier of Freeport, Maine. He chose a black walnut tree in southern Pennsylvania. Whether or not anyone heard it fall, the audience at Alice Tully Hall heard it light, bright and clear. 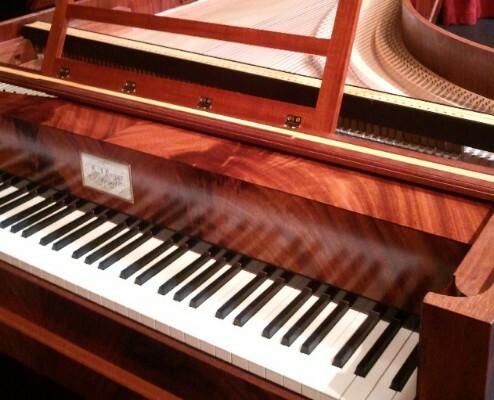 This fortepiano has a six and a half octave extended, with 80 notes (compared to the piano's 88). In different registers the tone quality differs. The bass buzzes and high notes tinkle. Its tone is quite different from that of the modern piano, with a softer feel and less lingering notes. Accents stand out, because they are different from the softer notes in both timbre and volume. They are quickly gone. The modern piano is more uniform. Bezuidenhout brings out the small scale perfection of the songs as Schubert tightens the screws on the voice. The fortepiano is suited perfectly to Winterreise. Padmore has a fascinating voice and delivery. Whether his notes emerge from the head, or the brow with a slight edge, or float in a pure beauty on the breath, they are very much Padmore's and of a piece. He deploys his skills with intelligence, yet with a rich sense of the feeling he is conveying. He is a deliberately compact performer, rail thin in black which makes him appear even tighter. His hands, but not his arms, move often. 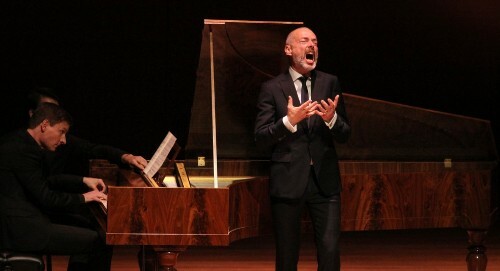 Has he considered his singer's need to move the arms and hands and condensed them into gestures which invite the audience in and also express his feeling. Padmore comfortably moves from the wistful sweetness of the will-o-wisp to the harsh cackle of a crow, hovering like a vulture. Sometimes he and Bezuidenhout are in conversation. Sometimes they dialogue and at others are in duet. In The Linden Tree, branches rustle in the fortepiano as Padmore charges his words with the loneliness and isolation of the poet. In Dream of Spring, the tenor movingly contrasts his beautiful images with the harsh horror of reality. Moving from the external world to the internal one, the artists concentrate and pull the audience into their focus. The Signpost and The Inn mark the climax of the cycle. Here, the journeyer accepts devastating loss, accompanied by a liturgical chorale on the fortepiano. Schubert does not pictorialize, although Bezuidenhout picks up the relentless trudging the composer writes. Padmore finds three elements characteristic of the piece: Repeated notes which he often treats identically as does Bezuidenhout, giving the poet's arc a relentness determinsim. Changes from major to minor within a song and phrase and the tantalizing open 5th add to the emotionally raw presentation. In the last song the organ-grinder cranks up his music and leads us we know not where. Padmore notes the strangeness of the piece, but he invites us into dark places as Schubert does. You don't know what is going on. Do we ever? Jane Moss, the artistic director of the festival, notes that live performance "...mimics life in that it is ephemeral...The experience of a performance is transitory...but far more complete than a picture you take...it's reaching something deep inside you." Surely the artists performing Winterreise satisfied deeply.